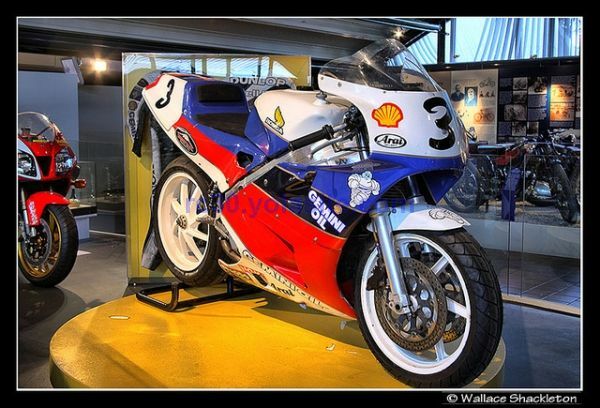 One of the many RC30s ridden by Joey Dunlop on display in Northern Ireland. Image courtesy of Mr. Shackleton. A picture that belies what would happen later that day; August 2nd, 1992. Steve and Larry Schwarzbach on the Yamaha OW01 would be involved in crash that would end Larry's life. 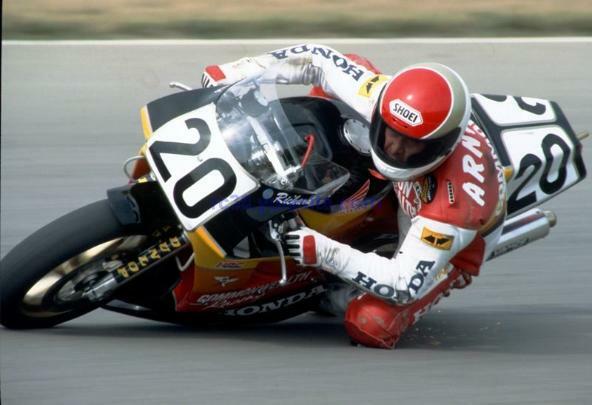 Steve was teammate to Freddie Spencer. This picture is copyright "Stu" Stuhler. Mr. Stuhler produces a blog about racing both past and present. I recommend you check it out here. 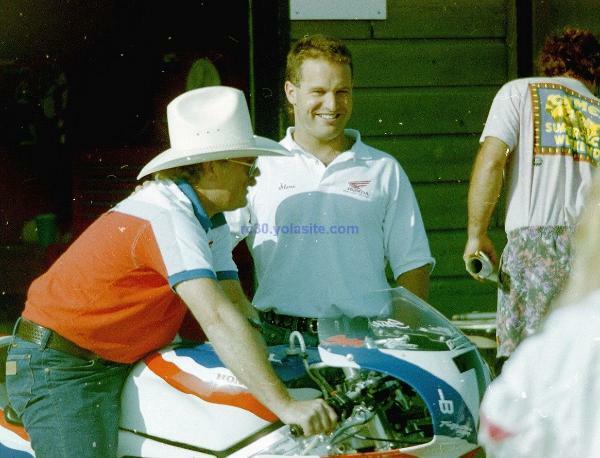 The late Randy Renfrow chatting it up with Reuben McMurter who is the 1988 Canadian Superbike champ on an RC30. 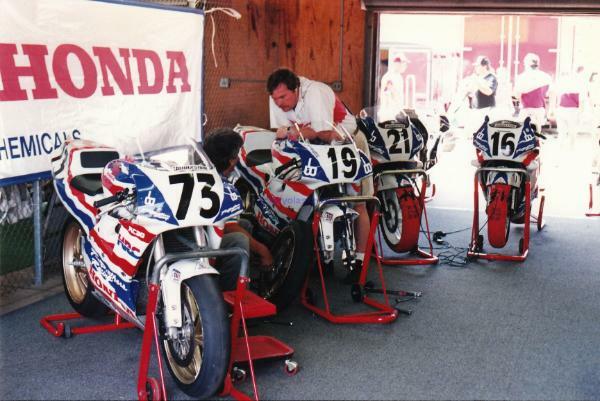 This was a one off ride at Mid Ohio in 1992 put together by Reuben and sponsored by Honda Canada and a few others. Copyright "Stu" Stuhler. 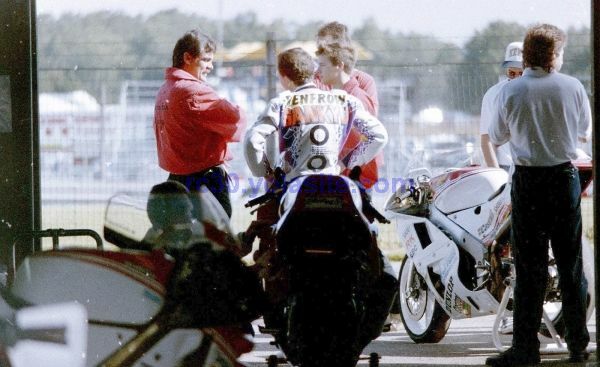 I think Randy is sitting on the CBR600 he also rode under Reuben's direction. 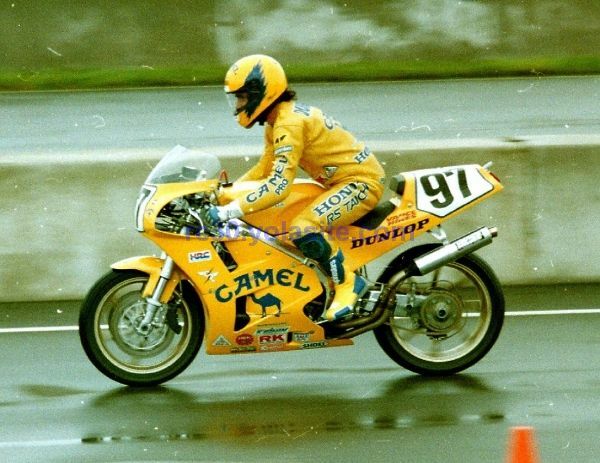 Miguel Duhamel in his younger days aboard the RC30. Miguel also did some endurance racing in Europe. 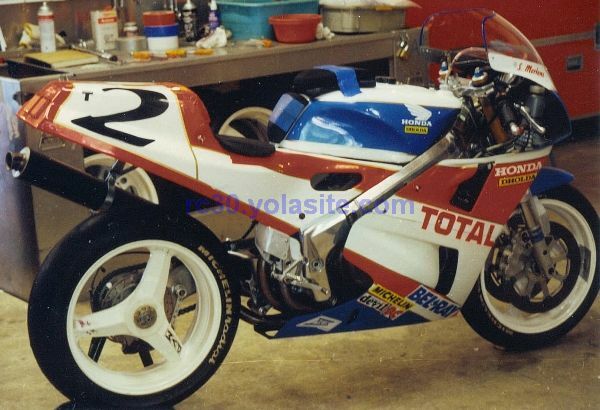 Miguel, his brother Mario, and Miguel's dad endurance raced an RC30 at the the Bol d'Or. If I remember correctly, they had problems with the rear wheel coming loose. 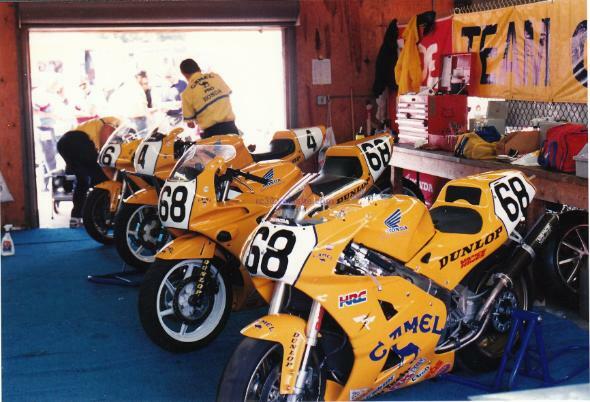 This image is an AMA superbike practice session at Mid Ohio in 1991. Looks a little treacherous to me. Check out that two stroke sized silencer too. This image is another great shot by "Stu" Stuhler. 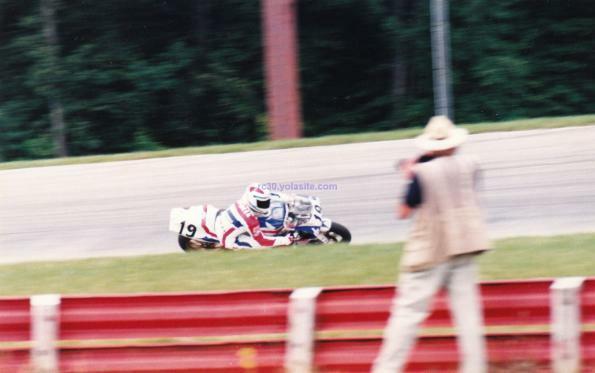 No Canadians here, but Fast Freddie braking hard on the Two Brothers bike will always make a great shot. Two legends in their twilight years of racing and still rippin' up the tarmac. "Stu" Stuhler takes the credits for this shot also. Note this bike, and Crevier's, had switched to the use of USD forks. 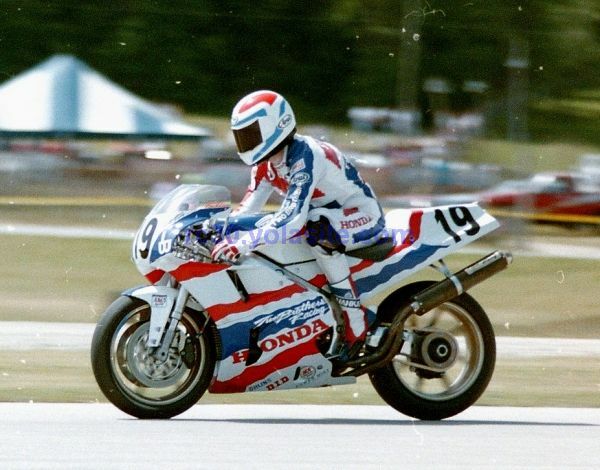 A beautiful Commonwealth backed RC30 at Brainerd. 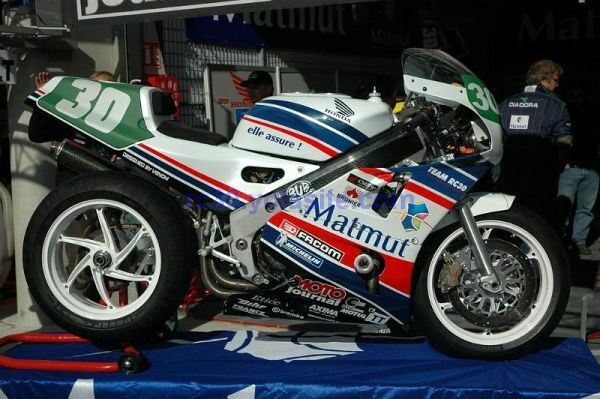 Miguel Duhamel was his teammate that year (picture of Miguel's similar bike below). If you want blood, you got it, as Fred's helmet used to say. Oscar sure liked his purple. Even the socks had to coordinate. The T bike for mister Stephane Mertens. Check out the foam pads on the tank. Stephane is a pretty tall guy. If you speak and write some french, or even if you don't, Christophe runs the RC30 forum. Some of the (16.5") rear wheels used this bike were on eBay in 2010. Cool wheels, but I would have put the front one on the other way. Dig that front to rear fender too. Steve Crevier and Pascal Picotte in qualifying. Canadians everywhere. 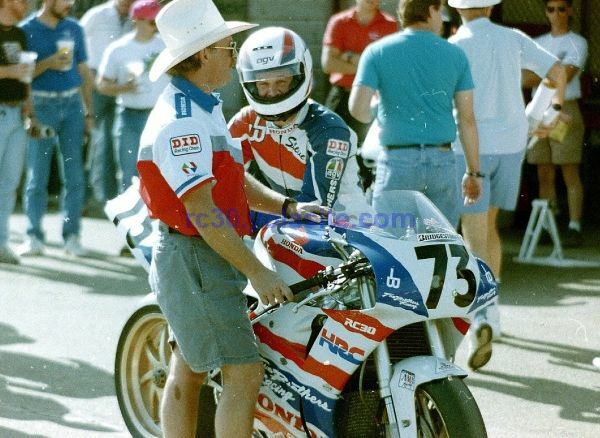 Steve and his tuner in the paddock. Steve is still quick even today. A man with boundless energy. The world needs more people like him. A young Mike Smith contemplating as he waits on the pit wall. McMurter Racing's Honda Canada funded machine for Randy Renfrow. At first glance this bike can look like an RC45, but it isn't. 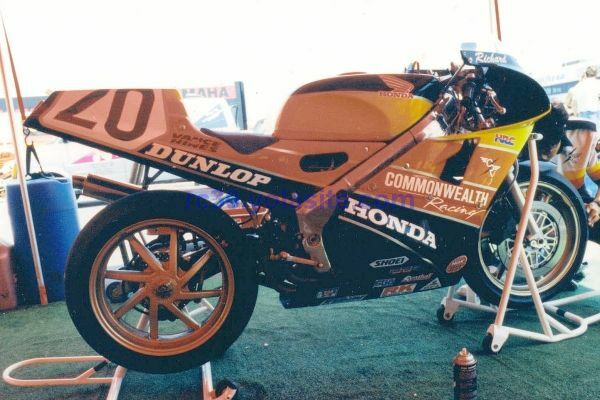 Even without the number you can discern this is Mike Hale's RC30 by the extended seating position. This bike has a reinforced swingarm, ram air and USD forks. 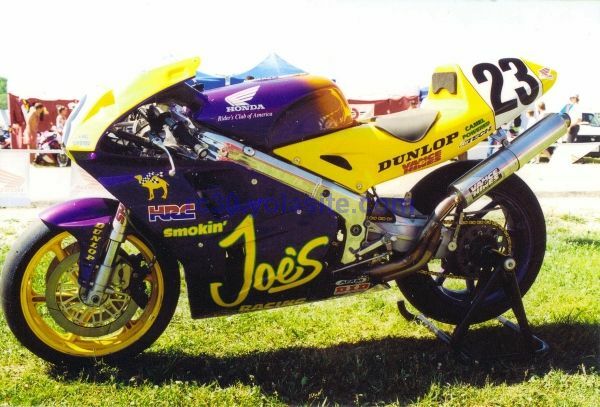 One of the final incarnations of the RC30 in AMA racing. Airtech still sell this FRP. 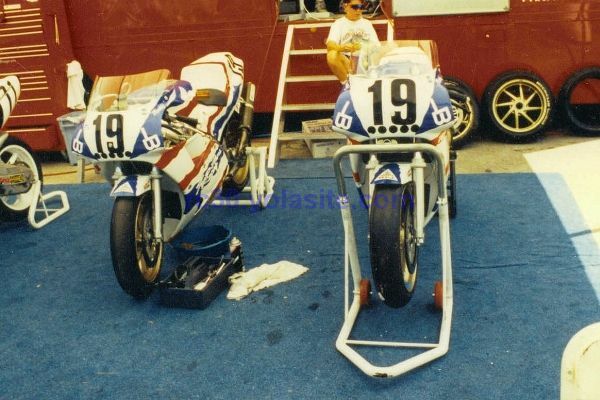 A couple of Fast Freddie's RC30's sitting in the paddock area. There were more of the #19 machines. Miguel's RC30 getting the once over by the mechanics. 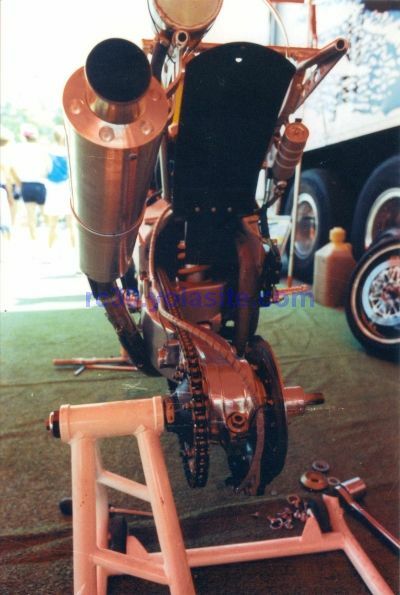 Note the absence of the pro squat linkage, as was normal on racing machines. 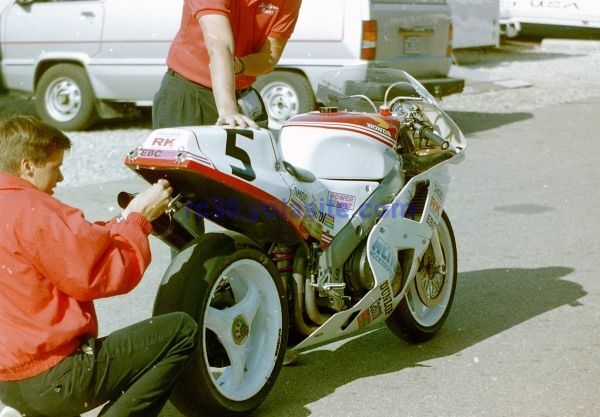 Another shot of a Mike Smith piloted RC30. 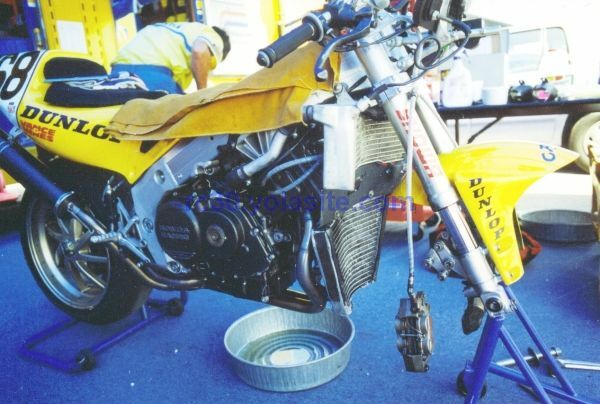 Note the monstrous lower radiator, right (and left) side exhaust and Showa USD forks. 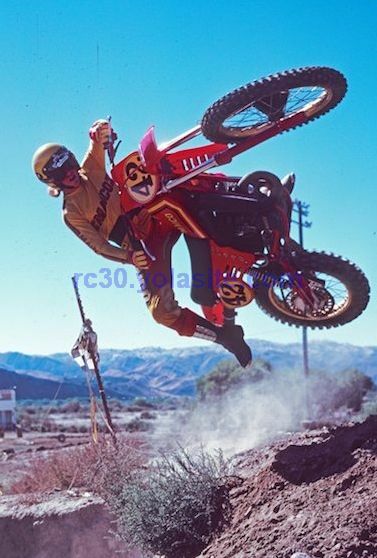 Maico doing what it shouldn't be able to. RIP Magoo.